November, 2015 | H&R Group K.K. 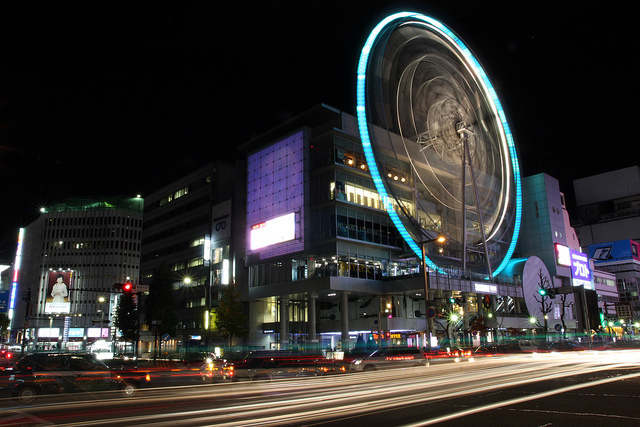 Sakae is essentially Nagoya’s city center in everything but name and is one of the busiest parts of town. It is famous for its vibrancy, drawing people from all over the region on weekends. By day the area is a coruscating hub of people shopping in the various department stores while at night the area hums with the energy of an active dance club scene, pumping out everything from hip hop to trance to techno and even Korean pop. There are plenty of things to see and do in Sakae, particularly when it comes to eating, drinking and being merry. Below are some of our favorites and recommendations. There are so many great eateries in the Sakae area it is hard to choose just one, but whenever I am hungry – particularly hankering for seafood – I head to Isonami Saisan. This 24-hour izakaya may look a little rough around the edges, but when it comes to grilling seafood at your table, this place can’t be beaten. The clientele is a great mix of families, friends on nights out, and even wedding after-parties. There is an English menu and if you don’t know where to start, I can definitely recommend the garlic tuna tail steak, the half-shelled crab ‘kani miso’ and the whole tuna jaw. If you are looking for expat bars, alongside Fushimi, Sakae is probably the place in Nagoya to go. The most popular is probably British bar The Hub Pub which gets particularly raucous on the weekends. However, if you are looking for something that actually resembles a proper pub with the atmosphere to match, The Curragh is it. Owner Teri-san is as welcoming a host as you could wish to find, and while their fish and chips is the best I have found in Japan, there is also a great mix of beers: from Brew Dog craft beers to Guinness and even Magners’ Irish Cider on draft. Some of the Department stores in Sakae have become Japanese institutions. Matsuzakaya, established in the area in 1611, is one of the oldest department stores in Japan, and Mitsukoushi isn’t much younger. However for products for the home with a modern and westernized leaning – from furniture to bedspreads, from cutlery to costumes – then Loft is perfect. It can be pretty pricey in there, but you can mostly be assured of the quality as well as the inform fashion sensibilities. Think Ikea without the flat packing, Allen keys, and dispose-ability. Nagoya is chock full of art galleries and cultural centers, but the biggest and perhaps best is the Aichi Arts Center. Located behind the Oasis 21 park and shopping complex, twelve stories above ground and five stories below ground, it houses an art museum, rental gallery, art theaters, the Aichi Prefectural Arts Promotion Service, and the Art Library. On the 10th floor, you can find the Aichi Prefectural Museum of Art which homes in its permanent collection the works of Pablo Picasso, Henri Matisse, Gustav Klimt, and Paul Klee. They also have Japanese artists such as Yuichi Takahashi, Ryuzaburo Umehara, and Sotaro Yasui, along with masterpieces of Japanese-style paintings by Taikan Yokoyama and Shunso Hishida. It’s really difficult to pick out just one international dining experience. Both The Red Rock and Outback Steakhouse offer great Australian grub. A recent discovery of mine is Higashi Sakura Pakuchi, a wonderful Thai restaurant that has a relatively authentic ‘street food’ feel as well as an excellent Tom Yum Goong, but for a really interesting dinner, check out Brazilian restaurant Sapucai. Not only can owner Didi dance up a storm (and gentlemen, keep an eye on your ladies, for Didi may look like a kindly old gent, but he’s smoother than sanded silk) but he can also whip up a feast. I’d recommend going for the buffet where you can eat as much as you like as waiters deliver flame-grilled chicken, pork, sausages, and beef to your table carved directly from swords. Seriously tasty meat. If you are ever stuck for something to do in Sakae, it’s highly recommended that you head over to Hisaya Odori Koen because there is nearly always something going on. In these chain of parks from Central Park to Angel Park that includes the Nagoya TV Tower, there are often music festivals of free performances, with either high school kids putting on their own shows or huge national events such as Nippon Domannaka Matsuri. There are frequent farmers markets selling organic goods and craft fairs with handmade products. The most southerly section of the park towards the Matsuzakaya and Parco department stores is the venue for some of Nagoya’s biggest international events such as the Thai Festival, the Vietnamese festival and Octoberfest. Until February 14 2015 it hosts the Akari Night illuminations. Did you know that high quality green tea is produced in Toyota City? Learn all about Japanese green tea, from the health benefits to the brewing techniques, from Mr. Yoshitaka Noba, one of the highest ranked tea connoisseurs in Aichi, and the owner of a local tea producer, Koukaen. You can experience grinding the tea leaves in a traditional way using the stone grinder, learn how to make a bowl of matcha, make matcha icecream and more! Enjoy Japanese green tea using all of your five senses! When: Sunday, November 29th 2015, 10:30 a.m. – 12:30 p.m. Contents: ① Short talk on health benefits and brewing techniques of green tea ②Experience grinding the tea leaves with a stone grinder ③Making and tasting a bowl of matcha. ④Tasting different types of Japanese tea. ⑤Tasting rice balls with green tea leaves ⑥Making and tasting of matcha ice cream. Application: Starts from November 19th 10:00 a.m. Presented by English Information For Friends (E-IFF), an group of volunteers associated with the Toyota International Association of Toyota city. They hold many events each year, mostly cooking classes, designed to introduce foreign residents of Japan to the joys of Japanese Cooking! Foreign residents who live in and around Toyota City (and their Japanese friends or family are invited to attend. Make sure your friends are signed up too! Maximum number of participants accepted: 20 adults (10 year-old and older) *Not available for children under 6. Recipes and explanation are available in English and Japanese. Bring your own apron and dish cloth. One of the great things about living in Japan is its frankly amazing public transport system. It is easy to forget that other countries cannot compete in this department, and become blasé and accustomed to it – I recently found myself impatiently tapping my foot at a two-minute late subway train, but then you see something new that makes you realize how great it is. Today I found out about the Kanto Area Pass. What is the Kanto Area Pass? For those of you who do not know, the Kanto Area Pass is a discounted ‘norihōdai’ (unlimited ride) pass for Tokyo and the surrounding Kanto area. It is marketed predominantly towards non-Japanese; however, it is not restricted to tourists, meaning that those of us who reside here can get in on the act. Valid for three days, unlike the Seishun 18 Kippu pass that is restricted to local trains, the Kanto Area Pass is good for unlimited rides using reserved seats* on ordinary cars on Shinkansen Bullet Trains, limited express and other trains (although this does not include the Tokaido Shinkansen) for a mere 8,300 JPY for adults or 4,200 JPY for children. Now, I am sure that you will agree that this is an excellent deal. Unfortunately, there is a downside as the Kanto Area Pass is only available until December 19 2015, when it will undertake something of a change. Like Superman going into a telephone box and coming out as, well still Superman, but in a slightly more expensive cape, on December 19 the Kanto Area Pass will transform into the Tokyo Wide Pass. With the Tokyo Wide Pass you havb pretty much the same deal – unlimited train travel on most JR rail lines in the Kanto area, but with a couple of minor tweaks. On the down side, at 10,000 JPY for adults and 5,000 JPY for kids, it is a little bit more expensive. However, its reach is extended to include the Tokyo Waterfront Area as well as the Gala Yuzawa, making it ideal for weekend skiing trips. There is more skiing at Nasu Kogen, as well as it being a popular retreat in summer. As well as skiing there are plenty of onsen hot springs in Gunma, including the famous Kusatsu Onsen. Another mountainous area, Karuizawa in Nagano Prefecture is home to many upmarket resorts and ‘ryokan’. Kofu in Yamanashi Prefecture is another beautiful old onsen town. The Izu Peninsula is home to one of Japan’s most beautiful coastal regions. Though perhaps the beach is something better left for the summer. Valid: Kanto Area Pass – Until December 19 2015; Tokyo Wide Pass – From December 19 2015; Both valid for three consecutive days. Reserved seating: *Those wishing to reserve seats on Shinkansen journeys must take their tickets to the booking office where seats can be reserved for no extra charge. -The service from Echigo-Yuzawa Station to GALA Yuzawa Station on the Joetsu Shinkansen is available only on the Tokyo Wide Pass between Saturday, December 19, 2015, and Sunday, May 8, 2016. For information on other discount train travel in Japan see our guide here. You can use Hyperdia.com to check train timetables. Click here for our guide on how to use the Hyperdia website. There are many great draws to the historic city of Inuyama in northern Aichi Prefecture, but none are perhaps so eclectic as the Japan Monkey Park. 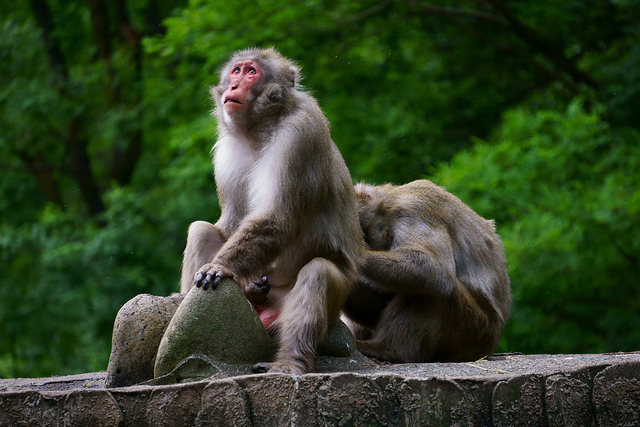 Set upon a luscious hillside overlooking the Kiso River, the Japan Monkey Park is a combined amusement park and zoological garden created to celebrate and preserve, that’s right, you guessed it, monkeys! The Japan Monkey Center is a zoological garden dedicated to primates from all over the world. It holds around 1,000 primates from 100 species within its 250,000m² grounds. Thanks to this vast expansive space, the animals can live in a relatively free environment in enclosures that broadly reflect their natural habitats. There is also a visitor and educational center at which you and your family can learn about how the monkeys live before going on to see the various enclosures of Gibbon Inland, Spider Monkey Inland, Squirrel Monkey Inland as well as troop of Japanese Yaku valley Monkeys. Be warned that some of the monkeys are given quite a lot of freedom and that there is a ‘drop zone’ over which some primates such as the spider monkeys traverse a specially created wooden bridge. A lot of fun to watch, but there are inherent dangers within! After watching the jungle VIPs going about their daily life, it could be time for you and your own little monkeys to start monkeying about, which is where the Japan Monkey Park amusement park comes in. Here there are over 35 attractions and rides for your to enjoy. Most of the attractions are catered towards younger children such as tea cup rides and rides emblazoned with Anpanman and Thomas The Tank Engine, however there are attractions for older children (and those of us who are still kids heart) such as the roller coaster, the Ferris wheel and the Canyon Splash. In the summer months the pool is particularly popular (i.e. crowded), and all year round there are plenty of shops and restaurants to choose from. When: Open weekdays 10:00 – 17:00, weekends & holidays 09:30 – 17:00. School summer holidays open 09:30 – 18:00. Hours vary by season, so see website for confirmation. How much: Park admission: Adults 1600 JPY, children (aged 2+) 800 JPY; Single rides cost between 200 and 500 Yen. Day passes are available for Adults 3900 JPY, elementary school students 3200 JPY, children (aged 2 and below elementary school age) 2400 JPY. Inuyama isn’t just about monkeys, and there is plenty to see in this historical city. Inuyama Castle is considered to be the oldest in Japan and is only one of four castles in the country to be deemed as national treasures. Check out the JIS info on Inuyama Castle (amongst other castles in Aichi) here. Cormorant fishing, or ‘ukai’, is a tradition that has been held in Inuyama going back some 1300 years. See the JIS info on ukai in Inuyama here. Inuyama Festival is one of the most vibrant and eclectic in Aichi and is a great place to see 17th century Karakuri robots. Read JIS’s info on Inuyama Matsuri here. Inuyama, and the Kiso river is one of the best spots for seeing the cherry blossoms of ‘hanami‘ in spring, and also for seeing the red and golden leaves of ‘koyo‘ in fall. Find JIS info on Inuyama hanami here, and koyo here. The cosmopolitan port city of Kobe is one of Japan’s biggest and busiest. Tucked into a nook between the Rokko mountain range and Osaka Bay, it is also one of Japan’s prettiest metropolitan areas. While two of its best known attractions, succulent Kobe beef and the hot springs of Arima Onsen will cost many yen to indulge, many of the natural, historical and cultural charms of the city can be experienced for free. The Rokko Mountains reach their loftiest peak at 931 metres. Hiking trails lead to several of the summits where panoramic views of the Kansai region spread out below. Very near the city, just a ten-minute walk from Shin-Kobe Station, reside the Nunobiki Falls, a quartet of hydro-spectaculars that form as the Ikuta River spills out of the mountains. The Ontaki, which twists 43 metres down an open rock face, is a particular favorite with photographers and nature lovers. Thanks to an abundance of high-quality Kansai-region rice and easy distribution through the port of Kobe, the city’s Nada District has evolved into Japan’s top rice wine-producing region. Sake breweries proliferate here and many offer free tours and tastings. Several maintain sake museums with exhibits, tools and machinery that explain the history and production of Japan’s signature libation. The Hakutsuru Sake Brewery Museum caters to foreign visitors with English pamphlets and videos. Kobe has many breathtaking viewpoints scattered across the city but most, such as the Kobe Port Tower, charge admission. Not so at Kobe City Hall where the observation deck on the 24th floor is free and open every night until 10:00 p.m. for gazing at the surrounding mountains, the seaside and cityscape from the 30-story tower. Next door to City Hall is Higashiyuenchi Park that began life as a foreigners’ settlement. Every year the park plays host to the Luminarie Festival that remembers the Great Hanshin earthquake that devastated Kobe in 1995 and claimed 6,000 lives. The lights go on for two weeks in December and the displays, attended by millions, are free. Also in the park is Flower Road, a thoroughfare immersed in blooms and botanical sculptures; Japan’s first flower clock also grows here. Legend has it that this temple is where Tendai Buddhism first took root in Japan after arriving from China in 805. The original temple is long gone and the current main hall dates only to 1953, with a reconstruction after the earthquake in 1997. The big attraction these days – literally – is Hyōgo Daibutsu, which claims to be the third largest Buddha statue in Japan. The first statue here was built in 1891 but was melted down for armaments in World War II. The current model, 18 metres high from street level, was raised in 1991. This small Shinto temple in the center of the city traces its origins back 1,800 years to the reign of Empress Jingu. According to early Japanese history writings the emperor assigned forty families from the settlement that grew up around the temple to look after its maintenance. They were known as kanbe, which in the Japanese language begat…Kobe. Today the shrine is a serene sanctuary from the bustling everyday life outside its walls. The expat lifestyle in Japan often means long durations of time spent abroad, and away from your vehicle. Before you go we wanted to remind you of a few things to keep in mind before leaving your vehicle parked for any length of time. Keeping in mind that navigation and other electronics systems available in modern cars can drain batteries dead after as little as 1 week left idle, so the most important of these is to disconnect your car’s battery in order to prevent it from going dead and stranding you at the airport, or at home before your morning commute back to work. This is especially important as battery damage is most often the responsibility of the person driving the car, rather than the leasing company or dealer’s responsibility, which makes returning to a dead battery not only inconvenient, but potentially very expensive. Do not to leave any items in the cabin that are visible to a passerby if your car is parked outside, for either short or long periods of time parked. Help reduce extreme cabin temperatures by purchasing a sunshade for your windshield. If you need some help disconnecting your battery you can take a look at Lease Japan’s handy guide. It has some simple instructions that could save you from the headache of a dead battery later! The problem with Japanese banks is that English support in-branch is virtually non-existent. While ATMs may have limited English menus for withdrawing & depositing funds, they often leave out menus for advanced functions such as making bank transfers from account to account. Online banking, while also available, is only in Japanese. Therefore, most expats choose to open an account with one of the below banks that provide English support. SMBC Trust Bank Prestia is a brand formed by SMBC Trust Bank after their purchase of Citibank Japan. They offer a good standard of English-language support, both in branch and online and provide an additional card for spouses (although there are no joint accounts in Japan). One drawback, after the first three months of opening an account, a minimum average balance of JPY 500,000 (JPY 200,000 if denominated in foreign currency) is required to avoid monthly account maintenance fees. Another, that you have to pay a small fee for withdrawing cash from all non- SMBC Trust Bank Prestia Brand ATMs if your average monthly balance is below JPY 1,000,000. A Japanese bank which has copied many of Citibank’s services. Although the standard of English-language support available in branches is not as good as you get with Citibank, the online banking facility is excellent. Advantages of Shinsei Bank are that there is no account keeping fee, and withdrawals from ATMs at post offices, 7-Eleven convenience stores, and major Tokyo area banks are free. However, Shinsei Bank will only issue one ATM card per account, and you may not be able to easily get a credit card through them. You can, however, still apply for a card through Citi Cards, as it is not necessary to have an account with Citi Bank.